Most Nikon DSLR owners are unlikely to have experimented with tethered shooting for one simple reason: Nikon charges in the order of $153 (Amazon) for the required software, where as Canon ships tethered shooting software with their DSLRs at no additional charge. There have been free alternatives available for some time now but they weren’t that easy to locate or use and had to rely on approaches (e.g. WIA) that couldn’t take full advantage of all of the camera’s capabilities. Nikon’s public release of newer SDKs redresses that and has spurred developers to produce more sophisticated alternatives. These may finally bring tethered shooting to the Nikon masses. Remote Control – Previewing, configuring and triggering your camera remotely can be extremely helpful when doing product, macro, time lapse or self portraiture photography. The feature set for free tethered shooting software has traditionally focused upon the needs of “Image Review and Workflow” users. The new Nikon SDKs allow better support for “Remote Control” users, especially with the introduction of Live View. User Type – Are you using tethering for “Image Review and Workflow” or “Remote Control” purposes? The latter user type has fewer options to chose from and may need to resort to commercial options to meet all of their needs. Camera – Cameras released prior to the D80 are unlikely to be supported by the more sophisticated, free tethering alternatives. SDKs for older models must exist but Nikon have only released SDKs product July 2007 or later (at the time of writing, this includes the D3, D3x , D40, D60, D80, D90, D200, D300, and D700). Operating System – Few tethering software vendors support both the Windows and Mac platforms. Only one Linux option appeared in my brief search on the topic. I had access to Windows XP and a Nikon D70S while preparing this post. As such I was unable to test Mac and Linux specific software or perform in depth testing of programs utilising the Nikon SDKs. Also some software has been released in German only and could not be reviewed. The material below focuses upon the free alternatives available, and has split the free choices into separate “with Extensive Camera Support” and “with Modern Camera Support” categories. Commentary about my experiences is included when I’m able to test the software. Where I can’t test software directly I’ve included links to relevant publicly available data. This can be used as a starting point if you wish to conduct your own investigation into application suitability for your needs. A list of commercial alternatives has been included for completeness. Limited detail is provided and I suggest readers use the vendor websites to gain a better understanding of the vendor’s solution. Mac users should definitely look into Stefan Hafeneger’s Sofortbild application. The feature set is impressive and I wish that DCamCapture’s feature set was as rich! If you use both a Mac and Adobe Photoshop Lightroom 2, or require support for older cameras, then StudioTether would be preferable. While Sofortbild has more advanced features than StudioTether many of them would become redundant when added into a Lightroom-based workflow. gPhoto2 was the only option I found for Linux users though I’m sure there are more available. See this post for details. Good luck with your adventures with tethered shooting, and please share your experiences with us in the comments section below. Tethering software in this section uses the underlying Picture Transfer Protocol, rather than Nikon’s published SDKs, to talk to your camera. This provides wider compatibility at the expense of supporting more advanced camera features such as Live View. Two options were tested to confirm whether they could meet my needs, with the results outlined below. An overview of all options (including those I couldn’t test) is included at the end of the section. 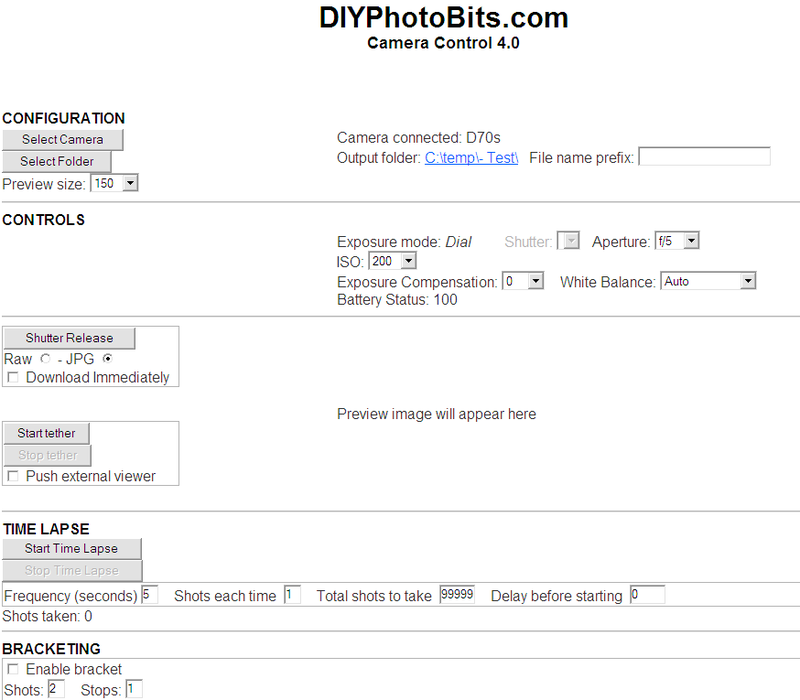 DIYPhotobits.com Camera Control is a hosted script using WIA over a PTP link to interact with your camera. It provides features for both Image Review and Remote Control users. It is designed to solely manage the link to the camera, with more advanced workflow tasks being left for the user’s preferred viewer/workflow tool. Personally I prefer this approach because there are plenty of viewers and workflow tools to choose from and I’d rather the author focus on getting the tethering right. The interface was a little slow on the initial connection – times of more than 2 minutes were common – but this seems to be a common complaint with WIA based applications. So be patient and give the application time to connect. The hosted script development approach means you may see the odd script error message pop up and be asked whether to continue running scripts on the page. In practice the program seemed to recover and continue performing its duties if you selected “Yes” to continue running scripts. There was one repeatable (and long standing) issue that will impact Remote Control type users. When you use the “Shutter Release” and “Download Immediately” features together the image capture format is swapped. e.g. select JPG and “Download Immediately”, click the “Shutter Release” button, and an NEF format file will be transferred to your computer. Strange, but once you know the issue is there you can easily work around it. Despite my concerns with the hosted scripting development approach, this was the only program I could get to consistently work with my Nikon D70S for tethered shooting. I’d recommend trying this program first if you have a camera not supported by the Nikon SDKs. 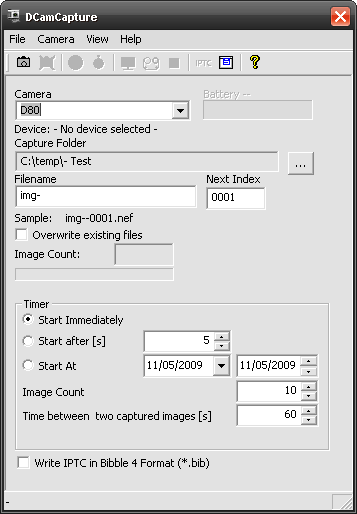 Loligo Tether is a .Net framework application using WIA over a PTP link to interact with your camera. It is designed for Image Review type users. It includes some basic image viewing capabilities but for best results should be combined with a dedicated viewing or workflow application. I had high hopes for this application and was planning to use it in preference to DIYPhotoBits.com Camera Control. Unfortunately there was one minor issue that got in the way: I couldn’t get it to consistently work with my camera when using either my camera or the program to trigger the shutter. To be fair to the author they did describe this as an alpha release so my expectations were unrealistic. This problem may be specific to my environment so you might want to test it yourself. I will keep an eye on the application’s progress but until reliability improves it is hard to recommend this for general use. Remote Control: Remote Trigger, Time Lapse, Set Exposure Settings, Set File Format, Bracketing Basic Image Review and Remote Control features. No Live View. Would need to be used with an external viewer/workflow application. Written as hosted script, so can be more error prone than a true application. One of the more mature free tethering programs. Remote Control: “All”, including Remote Trigger, Time Lapse, Set Exposure Settings, Live View See gPhoto2 documentation for tethered capabilities. See this post for a tutorial around its usage. Language(s): English Remote Control Remote Control: Remote Trigger, Time Lapse, Set Exposure Settings Basic Remote Control features. Minimal information available about the program. PTP based so assume it will be able to provide extensive camera support. Relatively young application. Remote Control: Remote Trigger, Time Lapse Basic Image Review features. Limited to no remote control features. Relatively young application. Remote Control: Remote Trigger, Time Lapse Basic Image Review features. Limited to no remote control features. Notable features are automatic publishing to web/FTP server, and internal scripting support. Remote Control: Remote Trigger, Set Exposure Settings, Liveview Basic Image Review and Remote Control features. Designed to integrate with Lightroom. Tethering software in this section uses Nikon’s published SDKs, rather than the underlying Picture Transfer Protocol, to talk to your camera. This provides simpler access to more advanced camera features (e.g. Live View) at the expense of camera support. At the time of writing Nikon’s SDKs support the D3, D3x , D40, D60, D80, D90, D200, D300, and D700 only. An option was tested to confirm whether it could be used for cameras that weren’t officially supported, with the result outlined below. An overview of all options (including those I couldn’t test) is included at the end of the section. DCamCapture is an application developed using the SDKs Nikon began releasing last year. This allows access to more sophisticated functionality than the previously mentioned applications (e.g. Live View) at the expense of supporting older cameras. Nikon’s D80 is the oldest camera model for which an SDK is publicly available. For me personally this means I’m unable to test this application as I own a Nikon D70S and the software refuses to connect to that model. DCamCapture provides features for both Image Review and Remote Control users. While it does support Live View and provides an IPTC editor I’d still suggest teaming the application with a dedicated image viewer/workflow tool for best results. From the current documentation it is difficult to know exactly how many of the exposure setting controls are available when trying to remotely control a camera. I can’t comment on the application usability as I don’t have access to a newer camera to test with. Digital Photography Tips and Techniques has reported some usability issues but it is unclear whether these issues are model specific, so its worth conducting your own testing in case it is model specific or they have released another update since then. To be fair to the author they did describe this as an alpha release so we should set our expectations accordingly. Remote Control: Remote Trigger, Time Lapse, Live View (inc recording) Basic Image Review and Remote Control features. No visibility or control of camera settings. Able to record Live View to avi file. Would need to be used with an external workflow application. Remote Control: Remote Trigger, Time Lapse, Set Exposure Settings, Bracketing Has both Image Review and Remote Control features. Feature set is the most advanced of any free tethering software considered during this review. All options listed in this section are commercial software. Please refer to the software websites to confirm whether the feature sets are compatible with your requirements. Most provide trial versions so you can properly test the product before having to part with any money..
OS: W2K, XP, Vista, Mac OS X 10.3.9/ 10.4.11/ 10.5.1 Image Review, Remote Control * Picture Control Utility: In certain Nikon digital SLRs such as the D3, D700, D300 and D90 customized image adjustment, including tone compensation curve data, can be saved to tailor the camera’s behavior to the photographer’s vision, improving efficiency when using multiple cameras at the same time. * LiveView support: Live previews direct from the camera are supported on the D3, D700, D300 and D90 when this feature is enabled. See what you are about to shoot! * Compatible with WiFi operation: In addition to supporting USB cable connections, Camera Control Pro offers compatibility with the optional wireless transmitter models WT-2a, WT-3a and WT-4a. When attached to a digital SLR, the WT-2a, WT-3a and WT-4a enable remote shooting and setting via a wireless LAN over WiFi. * Compatible with Nikon’s Image Authentication Function: Image data can be transferred and stored without affecting the authentication function. as you mentioned there are some issues, and it is early days. I’m more than happy to continue developing it, the reason I had not done much more on it was mainly due to lack of feedback, so assumed nobody was attempting to use it. @Mark, as mentioned I had issues getting it to perform some basic functions. I’m more than happy to work with you to resolve these as I know it can be difficult to debug these issues when testing only on the equipment you have at hand. I’ll drop you an email. Re expansion of the program I think there are some .Net framework features you could take advantage of to differentiate your tethering software from the rest. Using the .Net framework Raw codec support would be one. Expanding the workflow capabilities to include Photoshop compatible ratings, applying basic IPTC information to the whole shoot, and flexible renaming based upon EXIF date/times would also be extremely useful features not often found in tethering software. Essentially you are competing with import programs such as Downloader Pro so their feature sets might inspire further expansion. Thanks this is a really helpful guide – just what I’ve been looking for. This works like a charm…I then have lightroom 2.0 setup to show the most recent picture imported in. I felt like a kid with a new toy. Thanks for the information and your research in the tethering process. @James, Thanks for sharing your experiences with DCamCapture and Lightroom with us. I’m glad to hear you had better luck with the application than that linked article reported. Hey thanks for mentioning my script, glad it works for you. Surprised about the bug you mentioned though, I used it just a few nights ago for some self portraits of me and my wife and shot both jpg (while setting up the lights) and raw (for final). And it worked correctly, or at least so it seemed. That was the first time I’d used it in months. That’s why no development recently, I have very little use for it and it already does everything (and more) that I need. @Raymond, thanks for putting the effort into the script and sharing it with us all! I have experience the bug with multiple versions over multiple months. If it works fine for you maybe it is camera specific (I have a Nikon D70S) or there is something about my PC setup that changes its operation? Either way its an annoyance rather than a real problem. The script is still my main tool for tethered shooting. I currently doing my FYP with meddle with nikon SDK. Is it possible for you to give me a hand of how to start off using it? @Vivian, Unfortunately my Nikon D70S is not supported by the Nikon SDK so I have no first hand experience with coding using it. Can’t really help you with this, sorry. Great writeup, just what I was looking for! @Axel, I haven’t thought about FastPictureViewer as a tethering solution. Will have to give it a go, and add it to the commercial section if I can get it working. Particularly if it plays nice with the D70S! Yes, the default Lightroom tethering approach (Auto Import) is slow. Will have to wait and see if later drops of the LR3 beta decide to tackle this issue. Interesting site; it has wet my appetite. However I’m using a Nikon D80 with Mac OS 10.4.11 and can’t find anything that will give me live view. Will the camera support live view at all? @Stuart, Live view is a feature built into your camera that the APIs allow you to access. Involves hardware participation, namely swinging the mirror out of the road so the sensor can see through the lens. AFAIK no software can add Live View like features to an SLR that doesn’t have this capability built into its firmware. Sorry to be the bearer of bad news. @Matt: Yes it should work with your D70s, Nikon cameras have an excellent PTP implementation and work out-of-the-box with Windows (Vista and 7 in particular, without manufacturer driver, so they also work on x64). Just make sure the camera is in “PTP” USB mode (not mass storage) and press Ctrl+T in FPV. @Peter, The Sofortbild application states that it supports the Nikon D2X, it runs on Mac OS X, and the author still appears to be offering the software for free. I am currently evaluating NKremote with a D5000. Works well to control the camera, including live view. There are two things it does NOT do, and I wondered if anyone had any other suggestions. First, NKremote does not seem to allow you to name the image files, so you have to accept the file structure the program creates. Second, there is no way of reducing the file sizes as they are captured, so the smallest file you can create is the smallest one the camera will output. I am trying to capture images of equipment to insert in an inventory file, and I do not need a large high resolution image, something that’s about six inches wide would suffice, so let’s say 500×300 pixels. Right now I hae to capture the images using NKremote, and then downsize the images separately before I can use them. @Nick, I hadn’t really paid attention to those two aspects of the tethering tools so would need to look over them again to find those that had those capabilities. Personally I’d be surprised if any of the tools have the ability to downsize the images to 500×300 pixels for you as tethering is usually treats the computer as an extension of the camera, and cameras usually don’t have that capability built in. Different file naming schemes are more likely to be available though. Alternatively you could just use another tool (script?) to manage this part of the process. e.g. On Windows I know that XnView allows you to create batch processing scripts that should be able to do these tasks for you. I have a D70S. I want to do a RAPID succession (3fps is the fastest D70S can do), but these free programs (even Nikon’s program) can’t do it. Mostly they try to transfer the photos and USB is very slow to give me 3fps. So I really need a program that can do the triggering and the camera store the photos. DIYPhotoBits is a step in the right direction as it allows me to take the photo only (without transferring it), but for some reason it is slow at giving the order (6 photos in 10 seconds). @Djago, I think the protocol DIYPhotoBits uses is relatively slow, and as you have noted the other programs are unlikely to support trigger only tethering. If you had a newer camera it should be possible to code something via the publicly available SDK but the D70S SDK has not been published. Unfortunately I don’t think there will be a satisfactory answer to your question. Yes, unfortunately I don’t have any hope on speeding it up. At the level I’m working with (WIA Aut) it is already going as fast as possible. I suspect that the WIA Aut interface is waiting for the camera to say the image taking process is complete before returning control. If I could code straight WIA (which i can’t) I see there is a WIA Burst mode which perhaps could be faster, but only if it were supported all the way through WIA->PTP->camera which is unknown. And most importantly it has no controls to adjust camera values between shots so no bracketing. It would be pure timelapse. Search for WIA_DPC_BURST_INTERVAL if you want to consider coding this, but you’ll need to be doing proper Win32 COM, not just the COM Automation I’m using. There is new Nikon remote control software for the PC called ControlMyNikon over at http://www.controlmynikon.com. It uses the Nikon SDK for controlling the camera. I have just recently downloaded DIYphotobits and after some trial and error have finally got it to work with my sony laptop and my wee nikon D60. My question is, I take most of my pictures in portrait and was wondering if there is a way of setting the view images up to display in in this format as they are coming in landscape. which means I either have to tilt my head or the laptop to study the image. @Terry, There doesn’t appear to be a way to either force rotation of the image or have it pay attention to the JPEG orientation tag in DIYPhotoBits Camera Control. I’d suggest trying the “Push external viewer to display the latest image” feature to open the image in an external viewer that does offer one or both of those features. Hi. I am using Nikon Camera Control Pro 2 with a Nikon D3s. I had the same problem with my D300, namely, when in live view and tethered to the computer, a wireless remote shutter release will not focus and fire the shot. Unplug the tether, the wireless release works flawlessly, or turn off live view and it again works. Is something in the program shutting down that function for some reason? Do you know if any of the programs mentioned here will support using a remote to release the shutter. Oh, my wired release also will not fire it while tethered (IN LIVE VIEW); turn off LV, works fine. @Charlie, I don’t actually have a copy of Camera Control Pro 2 so I can’t answer for certain, but that sounds like a bug. It might be a design feature though so check your manuals to see if this combination is supported. It is possible that both the wireless shutter release and tethering are trying to use the same electronics in the camera (seems unlikely) so maybe they can’t be used together. I’m pretty sure most of the programs here support using the shutter release button on the camera while tethered. There should be little difference (electronically) between this and a wired remote so that should be OK. The easiest way to be certain is try one of the free Nikon SDK based options to confirm it works with your equipment. @Max, that was a big missed opportunity. Must be time for another coffee to help me wake up! @Charlie, I have Camera Control Pro 2 and ControlMyNikon and both do not support using a wireless remote when in Live View mode. I think this is just a limitation of the camera. I can confirm this on the D40, D80 and D300. Some alternatives to get this to work would be a mouse/keyboard with a long cord or wireless, or use windows speech recognition with a headset – i’ve used this with some success with controlmynikon. I’m curious – what type of scene are you shooting where you plan to use liveview tethered plus a wireless remote? http://www.sofortbildapp.com/ this is the link. @kelljones, I mentioned Sofortbildapp in the post, but I’m not a Mac user so I can’t actually try it. I have been hearing lots of good feedback about it though. Great overview. I have a large event to shoot this month and need to quickly display portraits from my D300 to my MacBook Pro. After finding this article, I downloaded the beta build for Sofortbild, now supporting LiveView, and tried it out last night. The LiveView seems to have a little more lag (I remember it being faster in Camera Control Pro 2, but maybe I’m wrong). But that’s not unexpected and is a great feature to have added. It’s a quick, clean and professional interface that looks like it should cost more than free. @Kriston, thanks for sharing your experiences with us. I am running a MacBook Pro and Nikon D2x. It appears as though the Nikon D2x is not on the list of supported cameras for LR 3 Tethered Capture. I am using Nikon Camera Control Pro 2 and it is set up just fine, but does anyone know if there is a way to disable the auto adavance selection if that feature is only available using Lightroom’s version of tether? I dont want to auto review the most recent photo. I have an assistant showing clients photos and I don’t want it to jump to the most recent import. I have had to go back to using LR 1 where this didn’t seem to be an issue. Any help would be GREATLY appreciated. @Dave, There is an auto-advance setting in the Library module’s Photo menu you could try but I don’t think it will solve this issue. Given you are using a third party tethering program you are probably using auto import but it doesn’t seem to have an equivalent setting. If your assistant uses another collection (e.g. Target Collection) to view the photos you can easily select a photo from the shoot, send it to the collection and I’d hope that doesn’t auto jump back to the most recently imported photo. Old dude here and retired, returning to photography after 50 years. First cameras and darkrooms were hand-me-down Speed Graphic 4×5’s, Argus c3’s and Federal Enlargers in my closet. During the Navy and Nam I briefly got crazy again with a few Nikon’s, Bronicas and Mamiyaflex’s, but I survived. Things have changed. Digital has sucked me back into the insanity. Have now run through a D80 to a D90 and plan to leap to full frame when the D700 is replaced. I am putting together a small home studio (AlienBees) and wanting to tether to an old Dell (XP) just to review, not control, my shots for exposure, pose, etc..Thoughts please. Also, having a tough time learning PS elements 8 but had dreams of a CS level when I got smarter..should I consider Lightroom..?? Several beers to you should you care to consider replying..Thanks dude…..
@wc, Lightroom should be sufficient to meet those tethering needs. It allows some control of the settings but is mainly used for viewing the photo immediately after you’ve hit the shutter release and that seems to be what you are looking for. I used to use Elements all the time then moved through to Lightroom so I’d recommend trying it out. If you take raw photos it is much quicker to process using Lightroom, though it can still be useful to have Elements around for some touch ups that are difficult to do non-destructively. Let me know if you have any more questions. A huge THANK YOU for the indications. I had been trying nikon software provided with the camera, other nikon trial software and it didn’t even recognise the camera! I tried DIYPhotobits, and man, it works! No complicated settings, not much to do, just connect the camera and folder where to go. voilá. The first tethered image in LR made me WOWWWW! @Ana GR, Glad you found it useful! The DIYPhotobits program has been updated a number of times since I posted this so if anything it should be better than I have described above. In the next version there will be settings for camera available, and over all it’s a free software. @Daniel, Haven’t tried it but it does look interesting. I need to refresh the tethering article and I’ll include this in the list to check out. Thanks Matt..Last Dec. I did load the DIYPHOTO tethering program on an extra Dell PC XP OS I had laying around and hooked up my D90. It fired right up and after a few min. of twiddling with buttons it did all I wanted it to do which was just display the image I exposed on a 19″ flat-screen. A wonderful tool indeed for my little home studio. The only issue is that it is VERY slow and I can quickly overrun it to the point of lock up. As the PC was not on the net I had no way of seeking help for the issue. If anyone has a solution to the speed problem please let me know. In the mean time I just pop off a few exposures of my subject to check lighting placement and then un-tether for the real work. Thanks again Shipmate..and several cold ones to ya…. @wc, Haven’t heard of that specific (speed) problem but it is worthwhile checking the site for updates. If you did end up getting Lightroom it should not have this same issue. Alternatively your D90 will support one of the SDK based tethering applications (e..g DCamCapture) and the SDK based connection should be a little more robust than that used by DIYPhotoBits. Thank you for your time into this topic. Question for you (and I realize by asking, you may not know but any direction is much appreciated)…..I have Nikon D5000 and I am tethering to a Macbook Pro. The Soforbild Program is working great but how can I get the pictures I’m taking to save to my SD card also? Is that even possible? Thanks for your help and your blog! @Meaghan, Sorry for the late reply. I haven’t been able to test that program first hand because I don’t have a Mac, so its a bit difficult for me to comment on how it could be configured to allow this. Do they have any forums that you can pose this question on? Not really sure whether this is a program configuration, program design or Nikon SDK issue. @Passerby, I’m not really in a position to test Linux software but I can still mention it after I verify the feature set. Thanks for bringing this to my attention. Matt, an update I just sent..and thank you for your efforts..
All the functions work as expected..except for the only thing I really want…for it to display the image as I take it. The only thing I want is an image displayed on the monitor as I take them with no hang-ups or overruns. I cannot get the just captured image to display..it will store to a designated file…but it will NOT display. Do you have a fix for this??. Is it perhaps because I am down loading on a 64 bit system and transferring to a 32 bit system …?? Thank you for any advice you can give and I do appreciate your excellent work on the Nikon SDK’s. I hope that Nikon someday sees the light on their propriety tethering software and enters the 21 century like the other excellent Japanese camera manufacturers. Happy Naturschutzgebiet meine Freunde aus Austin TX…..
Matt, an update to my update. The response to my above email to the dcamcapture guys. ..and that answers that…The quest continues. @wc, Thanks for sharing this info with us. It has been a while since I’ve looked at DCamCapture but I thought it was supposed to show the images. I’m now using Lightroom 3 for my tethered shooting and so displaying images isn’t a problem for me. Will need to check the current state of play for these tethering alternatives to see how they stack up. I have a Nikon D70s, with the last firmware update, the camera works superb in Mac OsX 10.6.7 and Sofortbild. It supports Live View for newest models. The latest versión 1.1.1 Beta sometimes fails, but the 1.0.1 Stable works fine. I use these soft for take astronomical images, but now have a PC Netbook and will try new software for Windows. Thank you very much for the article and shoot to these wednesday total eclipse!. @Jose, thanks for the comments. And please let us know if you find any good software that should be included in a followup article. Please feel free to review this new image viewer for use with tethering. Load it, double-click anywhere on the screen and select the folder to monitor. As images are stored in the folder (wired/wireless tether), StudioQik loads the images and displays them immediatly. The image files can be put in the folder via a wired tether app like StudioCap, or can be transferred using a Eye-Fi card. Currently only supports jpeg but RAW is coming soon. Goto http://www.jerseythings.com/public and download StudioQik.exe. You will need the .Net framework loaded for this to work. Sorry folks, it’s a 30 day evaluation. Can i use a 1st Generation iPad to tether to D700 and get same results.????? @Dennis, All of the programs mentioned here are for tethering to either WIndows or Mac PCs. I haven’t really looked into it myself but I know of friends using ShutterSnitch to wirelessly tether to an iPad 1. I’m sure there are other solutions out there as well but haven’t looked into this yet. Hi what about a Nikon D3100? What can I use for this? @Brennan, I don’t believe the Nikon D3100 has a published SDK so you will need to use something like DIYPhotobits.com Camera Control to tether it to your computer. It’s free, fast, and fully WIA compiant. @Gary, Thanks for the update. That is why I mentioned the product from DIYPhotobits – it has no Nikon SDK requirement so supports a wide range of cameras. Your StudioCap product, and some others, also use the same approach and should be fine for tethering a Nikon D3100 (amongst others). Thanks for letting us know about it. I just found out about tethered software (thanks for that) and tried Sofortbild with my Nikon D90 but the liveview does not work. The camera shows PC when connected to the mac but does not allow liveview to operate at all. Do you know why this is? And do you which software will allow liveview? @Peter, I haven’t really looked into tethering on Mac at all as until recently I’ve never had access to one. Not sure which software will work best on a Mac. I had thought Sofortbild would be the answer. Is it still being updated? I’ve read most of the websites but most seem to be just viewers when tethering. I need to be able to control the camera as it will be mounted on a boom when shooting. I also need it to write to the memory card and not the computer/tablet. Most applications seem to be only able to write to the PC since Nikon’s SDK software does not include the ability to write to the card when tethered. I’m using Nikon D300. If anyone knows which combination of applications to use and are very reliable, I would greatly appreciate it. Thank you. @Steven, For the combination of features you are looking for you may need to buy the official Nikon tethering software. it may have access to some unofficial SDK features that allow it to do what you want even though other software can’t. Haven’t tried it myself so can’t confrm that it includes all of these features though. Is it possible to tether a dslr without any software installed? Or rather a dslr will be simply connected to a portable monitor or media player? @Ralph, Not that I’m aware of. Mac systems might have some built in capability and I think WIA (Windows Image Acquisition) technology makes it possible to get images off the device, but any real tethering will require some software to be on your computer. It might be possible to find some portable software that will do this for you if you are worried about installing additional software on your system. Matt, I’m looking at tethering my D90 to my Toshiba Trive tablet. Would like to use tablet as live view only, anything else would be a bonus. Have looked through Android app store, but everythings for Canon :-(. Hi, everyone is talking about the software, but I’m wondering if anyone knows what cameras can tether? I’m using a Windows PC. I want to control the camera from the computer, as in taking pictures. My budget is around $300, if that’s possible. BTW, does the Nikon Coolpix Ps500 tether? Thanks. Great article, by the way. @Andre, Sorry about the delayed reply. Most cameras will support very basic tethering using software such as the CameraBits one, but detailed control requires a more expensive camera where the manufacturer has bothered to create an SDK for it. Unlikely to be the case with cheaper point and shoots as anyone interested in tethering is likely to have a larger budget for the camera purchase. Can’t really offer you specific advice on camera models as I don’t have the experience to make a sensible recommendation for you. Oh, and does the Canon SX230 tether too? Thanks. Has anyone tried to control more than one camera simultaneously from the same computer? Canon’s EOS utilities is limited to a single instance and the Canon SDK says that it only supports 1 camera. 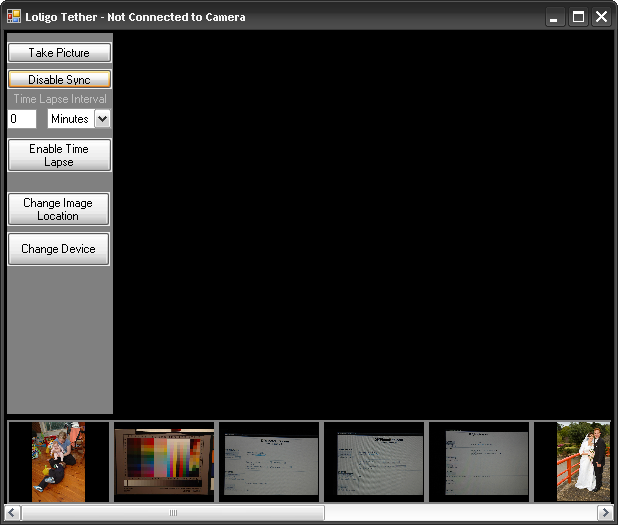 However, I have been able to control several cameras relatively well using separate applications running simultaneously. Anyone tried this with Nikon? How about Canon as well, and any observations? @Flightfollowing, Haven’t tried it myself. Sounds like it would be difficult to do reliably. @Irvin, There is no D40 Nikon SDK and I didn’t think the D40 had There is a D40 SDK but that camera doesn’t have live view so no software would support Live View style tethering or native Nikon based tethering. I think the recommended non-Nikon SDK based tethering software should work fine with the D40. Live view tethering and photo booth style printing is too much to expect from Nikon’s entry level SLR. @Jan, Thanks for letting us know about this Windows only tethering option, and good luck with its ongoing development. @irvin/Matt – Hi Guys, Actually, there is a D40 Nikon SDK – TetherPro uses it. You are right about the D40 not having LiveView though but all other functions work fine. @Todd, Thanks for the clarification. Just double checked the Nikon SDK application page and you are right of course. I appreciate the input. @Matt, thank you, I already started getting valuable input thanks to the users of your site. Will these work with the new Nikon D800? @Alan, I wouldn’t guarantee it. The more basic tethering options (i.e. those that don’t use the Nikon SDK) should work but last I heard the SDK update necessary to support D800 tethering wasn’t yet available. So the Nikon native tethering software will probably work (I doubt they need to wait for the official SDK) but other software will need to wait a little longer. Just thought I’d let you know TetherPro is on sale at $24.99 for a while. @Todd, thanks for the update. Guess Alan has an answer now and potentially a solution! I Tryed with my D90. It doesn’t work. Opened as administrator as required. When I tell the software to connect to camera, it just stops. @Tiago, I’m not sure which software you are using but it could be system or program dependent. Consider trying one of the options to see if it works any better for you. @Tiago, also depends on your OS – Nikon never really got their D90 Windows 7 drivers working properly. If you search the net you’ll see lots of issues with D90+Windows 7. First make sure that your cameras USB mode i ‘PTP’ and not ‘Mass Storage’. Some of the users that had similar problems with my software, solved it by running it in one of the Vista compatibility modes. To do that: Right-click on the application, select properties from the popup menu, and then go to the compatibility tab and set the compatibility mode. @Katrina, I’d suggest you won’t find any tethering software released now that will work with LR2. I’d focus on finding tethering software that can work with your camera and current operating system (even that might be difficult) and then use the “watched folder” capability of LR to import the photos as they come available. But given the age of the equipment (I bought my D70S more than 10 years ago) it may not be possible to find freeware that works with your equipment and operating system.